This is a post about the colours of watercolour paint used by botanical artist Rory McEwen. 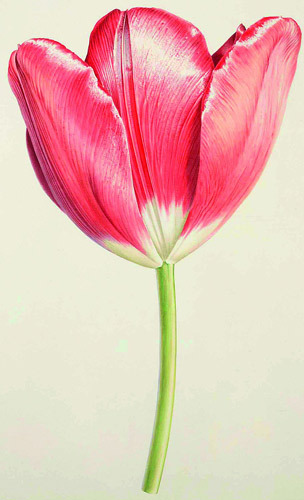 One of the characteristics of his botanical paintings is the intensity of the colour and the nuances he achieves. This partly comes from painting on vellum which is renowned for making colours look intense and fabulous. Vellum is not porous and hence the paint sits on top of the sheet of vellum. However the colours in his paintings are, of course, also partly due to the paint he used. One of the cases in the exhibition is given over to his painting materials. Knowing how much artists like to know about palettes I used my magnifying glasses to copy out the names of the paints he used. So what follows is a list of paint colours! It's difficult to know which brands of paint he used however evidence from the names and from the tubes in the display case suggest he used a combination of Winsor & Newton (much used by botanical artists) and Old Holland Classic Watercolours. It was very evident that some of the paints were fugitive as there's now no colour left. However it's unclear whether these were used a lot or not. Several people have expressed reservations about about the pigments and lightfastness of certain Old Holland colours (eg see Handprint's review of Old Holland). I think it more likely that when using Old Holland, McEwen may have trying to use paints which would have been available to painters like Georg Ehret. There again these were tubes which had not been used much so maybe he didn't use Old Holland much at all! Anyway here are the lists of colours - I've separated them into colour groups. For more about watercolour paints see my post about the best brand of watercolour paint for artists'. So - what do you think about his choice of colours? Do you agree it appears to be more W&N than Old Holland? Awesome to see this list, Katherine! Thank you for taking the trouble to compile it for your readers. I find this info fascinating. Interesting post . Okre is ocher and licht means light. I guess the quantity of Cadmiums is interesting to see, as they are usually very opaque and his images just don't seem to be full of opaqueness - they literally glow! So I wonder if Cadmiums behave differently on vellum? I have no idea as I haven't used vellum myself, but maybe some of your readers who have used the material could shed some light on the transparency of watercolours on vellum and if it changes at all. That would be really good knowledge to have. It also looks like he mixed his greens which is pretty informative, and maybe that is why there are so many different yellows? I tend to stick to just a few, but he had loads! Although I have just spotted that he used a lot of sap green looking at your list, so maybe that was his 'base' and then he extended it with blues and yellows. Fascinating. I reckon you can tell an awful lot about how somebody painted by just looking at their palette and which paints get used the most. I had the privilege to visit the exihibition with Christabel King (she was my tutor at Kew at the time I had a Margaret Mee scholarship). We discussed a lot about McEwen techniques and the colours he used. What I also found very impressive was the size of the vellums he used. don´t you think tha the colour you mentioned "greep licht" could be "groen licht" = green light? Thanks for sharing!! !